Alexandria, Virginia (CNN) - It's not everyday you get to have lunch across the table from the President. But that happened Tuesday afternoon, as President Barack Obama and Secretary of Education Arne Duncan made an unannounced visit to FireFlies restaurant in Alexandria, Virginia, as this producer was eating lunch. The President spent nearly an hour at the restaurant. It was the second straight day Obama made an impromptu visit. On Monday the President and White House Chief of Staff Denis McDonough made a quick run to a Starbucks down the street from the White House. Marylisa Lichens, co-owner of FireFlies restaurant, told CNN that she wrote to the President in January and invited him over for lunch. LIchens said business has been slow and hoped that by writing to Obama and inviting him to have a burger, business would improve. "I'd seen pictures of him eating burgers around town and I said he was eating at the wrong restaurant," Lichens said. Anthony Damiani, the only waiter on duty Tuesday, did not expect to serve the President. The college student has only been on the job for a few weeks while he's home for the summer. "I had no idea this would ever happen. My phone has just been buzzing the entire day, my friend's keep asking, did you really serve the President? Let me see a picture," Damiani said. He added that Obama ordered the "American Burger with cheddar cheese, and only got lettuce, tomatoes, and mustard on it. He also got French fries and a salad." Before leaving, the President approached a woman seated next to him and said, "You've got a beautiful baby." Obama then made his way through the restaurant shaking everyone's hand. When someone asked for a selfie, the President said, "I'll be here too long if I take a selfie with everyone. I've got to get back to work." Lichens said she was very grateful and very touched that the President took the time to read the letter and visit her restaurant. Do right wingers EVER stop hating? In dept.20 trill$$.10 mill still uninployed.health cair up up up $$$ most cant pay...out of Irac irac now turning to el Q.homeland.but glad we are out! irs,nsa,epa,hm land s.blm.ect all anti American pupets & well armed..made crack same as coke..n other things.& theres SS Gen Holder.&if ur a gay hispaic banker ur doing real good .. left right same thing. so he eats bergers real story would be if he liked it or?& was he just hungery or did barry have da munchies..& prayin 4 him & us all. 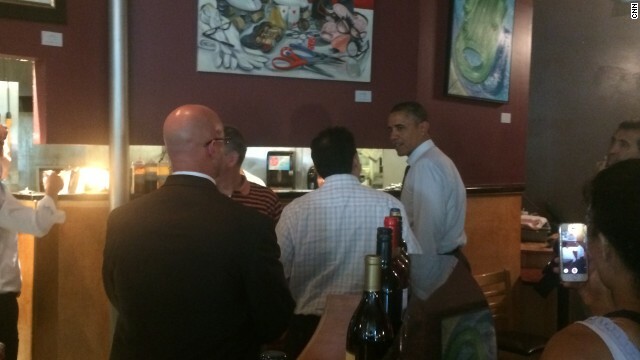 Well I'm no fan of the man's policies, but to have your restaurant visited by the President....that's pretty cool. C'mon people. Very good Yolanda. Think a thunk .....what????? Ordering an American cheeseburger and fries? It's just another publicity stunt to hide the fact that he's a communist Kenyan Muslim socialist born in Cuba. Awwwwww. He's just one of the "little people", like you and I.
U guys r political nuts.